Prolong the life of your Birkenstocks with repair work. We are an Authorized Birkenstock Repair Retailer so you can be assured your shoes and sandals will be given our expert attention.Please call or bring your shoes to the store for more information and to make shoe repair requests. (800) 648-3148. If your Birkenstock footwear has cork footbeds or EVA soles, both can be damaged by exposure to concentrated heat or extreme temperatures. Do not leave your shoes in direct sunlight, or in closed cars on warm days. Keep Birkenstock footwear away from campfires, fireplaces, and indoor radiators. If your shoes become wet, allow them to air dry slowly, away from direct heat. Prolong the life of your Birkenstock footwear with heel and toe taps. 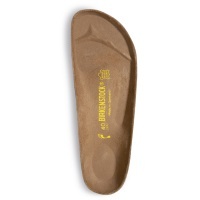 They should be applied when the EVA soles have been worn down to within about ¼” of the cork footbed. When worn down more than this, replace the soles. If your soles tend to wear unevenly, repair them promptly to ensure your feet remain correctly balanced. Visit your local authorized repair center for original Birkenstock repair materials. To keep your Birkenstock Footwear looking as good as it feels, follow these easy steps. To protect from water and soil spots apply a spray water repellent regularly. Brush uppers with a Nubuck/Suede brush to pull up dirt and dust and restore the nap. Use a mild leather cleaner to remove stubborn stains and follow with a Nubuck/Suede brush when dry.